In 2008, Pleasant View Gardens in Loudon, NH made the switch from heating their greenhouse with fuel oil to wood chips. They received a return on their investment in less than 3 years. Heating with biomass in New Hampshire makes sense because New England and eastern Canada produce a lot of woodchips. This started me thinking about other options for heating greenhouses. In Maine, we think about heating a lot. I’m no heating expert, but I’ve been seeing a variety of articles and blog postings on the topic coming through my newsfeeds. I decided I would do a little digging and come up with a list of resources that might help to explain system options, factors to consider when choosing a heating system, and how to reduce heat loss. Types of heating systems can be divided into two groups, Central and Local. Central heating systems consist of a boiler in a central location. Boilers heat with steam or hot water and can burn a variety of fuels. Local heating systems are usually placed at one end of the greenhouse. They can be unit heaters, convection heaters or radiant heaters. 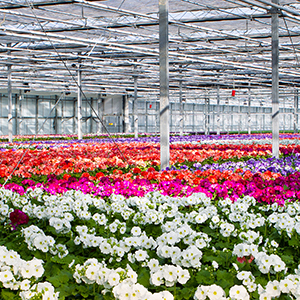 Central heating systems are used most commonly in larger commercial greenhouses due to cost. Local heating systems are more suitable for smaller greenhouses. First of all, what are you growing? Lettuce doesn’t mind a cooler environment. Basil, on the other hand, likes to be kept warm. The type of crop you are growing, combined with minimum outdoor temperature in your region, determine how much heating your system will have to do. Another factor is size of the greenhouse. Your greenhouse or heating system sales representative can help you determine where your greenhouse falls on the scale of small to big. Make sure to factor in potential plans to expand your greenhouse in the future. It’s also important to consider fuel efficiency. The price of oil today is not necessarily the price of oil tomorrow. You want a boiler that burns whatever fuel you choose as cleanly and efficiently as possible. That’s just good business and responsible stewardship. Whichever company you hire to design and install your system will be able to determine the best size to suit your needs. However, if you love math, click here to do the figuring yourself: How to Size a Heating System. Boilers can burn wood chips, logs, coal and Fuel Oils # 4, 5 and 6. Unit heaters use #2 oil, Kerosene, LP and Natural gas. Convection heaters can burn wood, coal or agricultural waste products. Radiant heaters usually burn natural gas. Biomass 6 Years Later: Would Pleasant View Gardens Do It Again? No matter what type of heating system you use, you are not maximizing its potential if you don’t take basic steps to conserve the heat it produces. The most efficient system in the world is not going to reduce your heating costs if the greenhouse door is not weather-stripped and your plastic is dirty or torn.